We will present three papers on code examples, API visualization, and spatial awareness aids at CHI 2018 in Montreal. Our group presented papers on VidCrit (video review), Toastboard (circuit debugging), and DemoDraw (motion illustration) at UIST in Tokyo. I am now the Faculty Director of the Jacobs Institute for Design Innovation. I received this year's Jim and Donna Gray Faculty Award for Excellence in Undergraduate Teaching from UC Berkeley's CS Division. Our work on multi-device storyboards received a Best Paper Award at CHI 2016, and our Drill Sergeant extended abstract received a Best Late Breaking Work Award. I was appointed Interim Director of the Jacobs Institute for Design Innovation at UC Berkeley while we search for a permanent successor to David Dornfeld, who passed away unexpectedly at the end of March. The new home of the Jacobs Institute for Design Innovation opens its doors. Guest DJed with DJ Noon on Berkeley's KALX radio. I was promoted to Associate Professor with Tenure effective July 1, 2015. Will McGrath presents our fabryq platform for Bluetooth Low Energy prototyping at EICS in Germany and wins a best paper award. I'm featured in a story in the Berkeley Engineer magazine. I received the Computer Science Divison's Diane S. McEntyre Award for Excellence in Teaching. I am an Associate Professor of Electrical Engineering and Computer Science at the University of California, Berkeley. My research in Human-Computer Interaction focuses on novel design, prototyping, and implementation tools for the era of post-personal computing. My group investigates how better software and hardware can facilitate the exploration of interactive devices that leverage novel form factors and technologies (e.g., sensors and actuators). 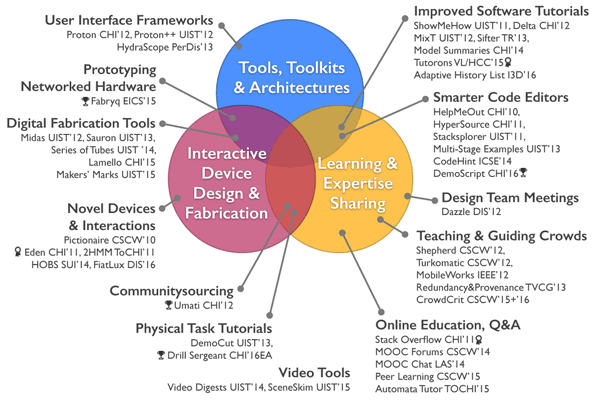 We also investigate how software can help students, designers, and makers to learn and share their expertise online. Methodologically, my group predominantly focuses on systems research: we contribute complex, working interactive systems that embody our research ideas and enable us to test specific hypotheses. However, I also appreciate (and we conduct) careful, controlled experiments. I am a Qualcomm Faculty Fellow and have received an NSF CAREER award, Sloan fellowship, and Okawa research award. My group predominantly publishes at the top HCI conferences UIST, CHI and CSCW. We also publish in more topic-specific venues like DIS, ICSE, VL/HCC, and Learning@Scale. Our work has received multiple best paper prizes at these conferences. I am the Faculty Director of the Jacobs Institute for Design Innovation, a new undergraduate teaching institute focused on hands-on, human-centered design. 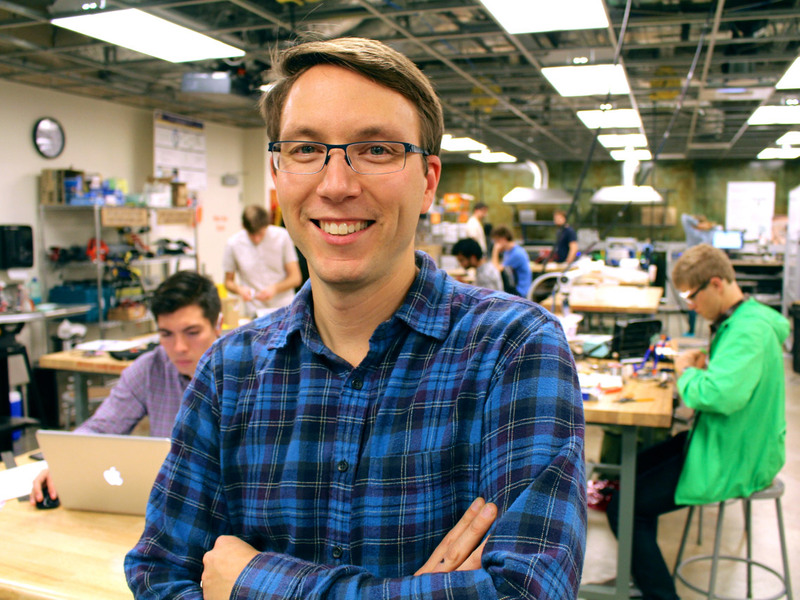 Previously, I co-founded the CITRIS Invention Lab, a lab equipped with many digital fabrication and rapid prototyping tools. The lab serves as inspiration and testbed for many our research projects. I am also involved in the Berkeley Institute of Design and the Swarm Lab. I spend time with great colleagues at the Berkeley Center for New Media, and the Visual Computing Lab. I received my PhD from the Stanford Computer Science department in 2009 where I worked with Scott Klemmer (dissertation). I received an MSE in Computer and Information Science as well as Undergraduate Degrees in Digital Media Design and Communication from the University of Pennsylvania in 2002. Thinking about applying for a PhD/Masters/Internship/PostDoc in HCI at Berkeley? Do not email me directly about your application or request - I cannot respond to every message. Read this advice instead. I am looking for strong PhD and postdocs students in the areas of programming tools, programming education, design tools for digital fabrication, and IOT systems. Berkeley's graduate application deadline is 15 Dec 2016. Postdoc candidates should get in touch with me directly via email. If you are from Germany, you can apply as a DAAD-sponsored postdoc working with me through ICSI. Undergraduate Cal Student interested in (Interface) Design? The Course Thread in Human-Centered Design which I co-initiated lists relevant courses across the university as well as reading materials. 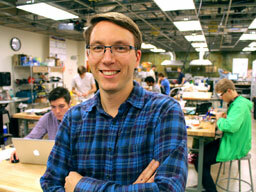 You may also want to get involved in Berkeley Innovation, a student-run design group. In Computer Science, you should take CS160. If you did well and want to deepen your understanding of HCI research and practice, sign up for CS260B or CS294-84 (Interactive Device Design). If you have completed either of these courses with outstanding results, come to my office hours to talk about undergraduate research opportunities. You can also look for projects my group has posted on Beehive. For a full list, see my profiles on: Google Scholar, ACM DL, or Microsoft Academic Search. The Future Is 3D-Printed (UC TV, Jan 2013) features interviews with me and Ron Rael (Architecture). Tim Campbell, Floraine Berthouzoz, David Dornfeld, David Wessel. Maneesh Agrawala (Stanford), Paul Wright (Berkeley), Tapan Parikh (Berkeley), Alice Agogino (Berkeley), Ras Bodik (Washington), Armando Fox (Berkeley), Marti Hearst (Berkeley), Tovi Grossman (Autodesk), George Fitzmaurice (Autodesk), Jan Borchers (RWTH Aachen), Steven Dow (CMU), Yang Li (Google), Kurt Luther (CMU), Scott Klemmer (PhD advisor - Stanford), Tony DeRose (Pixar), Michel Beaudouin-Lafon (Univ. Paris), Wendy Mackay (INRIA), Lora Oehlberg (INRIA), Wesley Willett (INRIA), Mira Dontcheva (Adobe), Wilmot Li (Adobe), Gautham Mysore (Adobe), Dan Goldman (Adobe), Sean Follmer (Stanford), Loris D'Antoni (Madison), Rajeev Alur (UPenn), Mahesh Viswanathan (UIUC), Sumit Gulwani (MSR). Copyright © UC Berkeley HCI · css design: Luka Cvrk. My group is grateful for financial support from Adobe, Google, Intel, the Okawa Foundation, the Sloan Foundation, and the National Science Foundation.